Updated Monday April 1, 2019 by Holliston Youth Football and Cheerleading. The Holliston Youth Football program provides an atmosphere where youth football players learn the fundamentals of football while participating in a competitive league. The program emphasizes teamwork, leadership, respect for one another, safety and fun. Boys and girls 4th grade through 8th grade are eligible to participate. 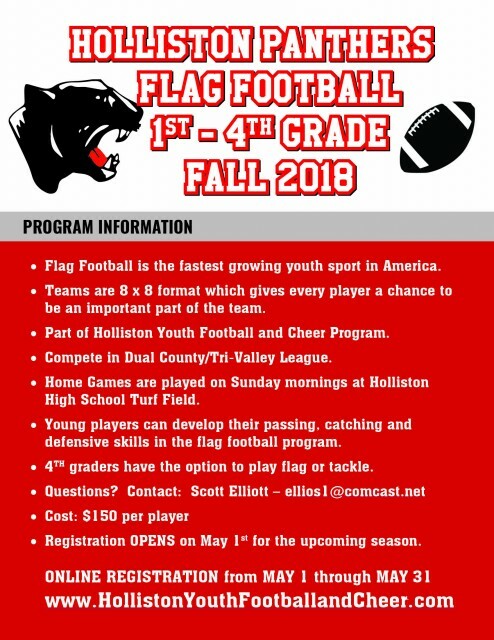 Flag Football - NOW being offered in Holliston! 1st grade through 4th grade are eligible to participate. PLEASE NOTE THAT NO CHILD WILL BE ALLOWED TO PARTICIPATE IN ANY PRACTICE OR GAME UNTIL ALL OF THE ADMINISTRATIVE REQUIREMENTS ARE MET. American Youth Football is unique among other youth sports programs in that it requires its participants to maintain satisfactory progress in their academic studies. Report cards from the most recent school year are required. If the participants grade average drops below 70%, a scholastic eligibility form must be signed by a school administrator. Any participant with a grade average over 96% is eligible to be nominated as an “All-American Scholar. You will be notified if your child is eligible. The success of our organization depends on parent participation. We have many volunteer opportunities for the upcoming season. Please consider joining us! We are looking for 3 folks, 1 Lead with good organizational skills to manage HYFB’s Equipment. Primary responsibilities are equipment hand out & equipment collection. HYFB sends the helmets out to the manufacturer to be certified. The lead person would be on the HYFB Board. Game Day – Mandatory Play Requirement (MPR) counters. If you are interested or have questions, please call Scott Elliott 781-820-5194 regarding Game Day Operation & Equipment or Mary Killelea 508-361-4326 if you are interested in Concessions, Spirit Wear or Fundraising. The Tri Valley/Dual County Football League requires that all parents associated with the program adhere to the Code of Conduct Agreement as stated in the registration contract. Season begins on the weekend of Saturday, Sept 2, 2018. Most all other games are played on Sundays. During the season, any player that misses more than 1 practice during the week will not be eligible to participate in that week’s game. **Weeknight practices will be on Tuesday and Thursday. This is subject to change based on field availability. Players will be contacted prior to the start of pre-season practice regarding equipment distribution. Team Placement: Holliston has 4 competitive levels that are based on the American Youth Football Schematic. Each team will play an 8 game regular season schedule followed by post-season playoff games. In cases where we have multiple teams at a level, teams will be drafted in accordance with the guidelines established by the Tri-Valley/Dual County League. A TV/DC league official will supervise the draft. Requests for team placement will not be accepted. In order to enhance both the player and the team’s ability to succeed, football players will be placed on the lowest level team that they are eligible for. 1. Grades can be combined by the Association, with players playing "up" on a team designated for a higher grade, but players may not play "down" on a team designated for a grade lower than their grade. Players exceeding the high end of the age range for their designated grade must play up to a higher grade level for which their age does not exceed the high end of the specified age range.